:d): Megindult a szavazás! / The vote has begun. Mai naptól lehet szavazni a blooming beautiful pályázaton! 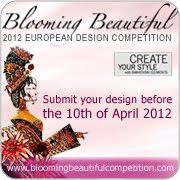 Online voting is opened at the Blooming Beautiful Design Competition! Visitors to the competition website are encouraged to vote for their favourite designs (one vote per design per person). The most popular designs are sorted by the highest rating received. This rating is calculated on the number and type of vote received (1 point given for Good Effort, 2 points given for Like, 3 points given for Love).